We haven’t done a cupcake here in a while. And in the last few weeks everyone has been talking all things pumpkin. So who am I to resist this call? I can get into the whole pumpkin vibe. Easy. Remember these? Pumpkin cinnamon rolls? They were amazing. And these cupcakes are too. They taste like fall, or what I imagine fall to taste like – being South African I have only ever experienced autumn but I have this feeling that fall, as termed with notes of longing, reverence and memory by all North Americans I meet, is something completely different. Perhaps it’s because winter falls in July and is not therefore associated with Halloween/Thanksgiving/Christmas and does not signal the on-coming holidays that I don’t hold this season in such awe. I don’t know and now I’m rambling. So to these cupcakes. I have of course, consulted the bastion of American baking, the queen, you might say, that is Martha. You can find her recipe here. Unlike other recipes I examined, this one does not call for ‘pumpkin spice’. What pumpkin spice is, I cannot say for sure, but I imagine that it tastes like the combination of the spices in this recipe. I’ll be honest, I changed only the flour to white spelt flour and added in a 1/4 teaspoon of ground cloves. I also browned the butter – because, when in doubt, always brown butter. I’m sure it adds a nutty, whole-rounded flavour to the finished cupcakes but that may just be me trying to be a pretentious food blogger. But brown the butter anyway. So I’m not going to repost the recipe here, I hardly made any changes and wouldn’t if (when) I make them again (except to remember perhaps, the weight of things like butter in grams). 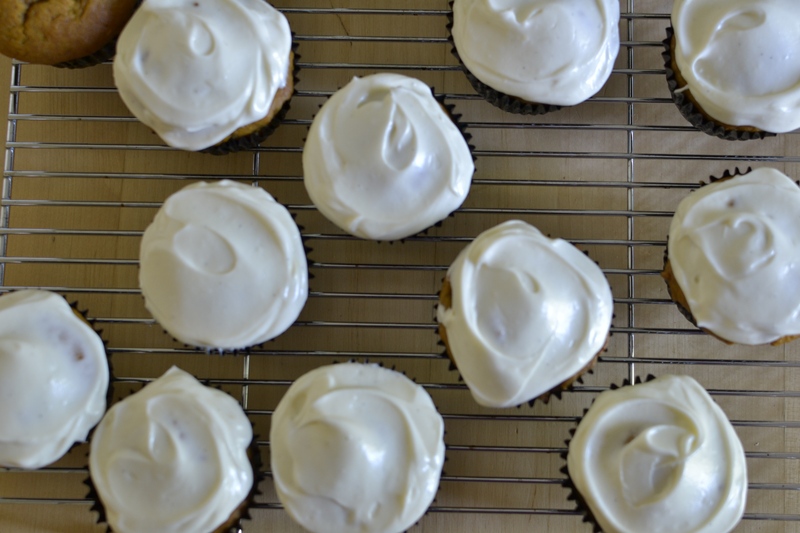 They’re iced with cream cheese frosting, the recipe for which you can find here. So instead, I leave you with a pumpkin spice cupcake photo essay.